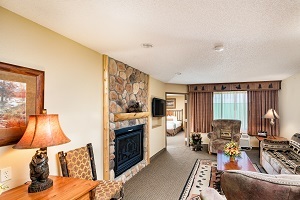 The Best Western Plus Kelly Inn & Suites has three (3) two-room fireplace suites attractively decorated with a country flair and all with oversized jetted bathtubs. We also have other suites with oversized jetted tubs with some rooms having separate walk-in showers. We offer business executive rooms, and standard rooms with two queen beds or one king bed. Three suites have separate "living areas"